40% of rejected drugs developed by the pharmaceutical industry fail due to their adverse affects on the heart. Now, researchers from the preDiCT project have built the most accurate computer models ever to help the pharmaceutical industry know which drugs are more likely to disrupt electrical activity in the heart. PreDiCT is just one of 26 projects that are part of the Virtual Physiological Human Initiative - it's goal is the creation of a 'virtual you', down to your face, skin, muscle, bones and DNA. These simulations will greatly improve disease, drug and health treatments for the public. A cutaway view of a heart model showing specialized 'telegraph wires' that conduct electrical signal quickly through the heart. If heart tissue is damaged by disease or injury, simulations like this can identify the ideal placement of pacemaker electrical leads, that help to activate all parts of the heart at the right time during each beat. Image courtesy Drs. Rafel Bordas, David Gavaghan, Vicente Grau and Blanca Rodriguez, University of Oxford. The shelves of pharmaceutical companies are lined with drugs that never made it to market. Researchers can pour all of their time into a particular drug, with millions invested, only to find out at the final stages that it's not fit for people to take. One of the biggest reasons for drugs failing to hit the marketplace is they have side effects on the heart; around 40% of rejected drugs developed by the pharmaceutical industry fail for this reason. Until now, that is. Researchers from nine partner institutions in Europe have built computational models of the heart's electrical activity as part of the preDiCT project, which finished in May 2011. They can now more accurately predict which drugs are likely to cause arrhythmia - abnormal electrical activity in the heart that can be fatal. The breakthrough came in January 2011 when researchers in preDiCT identified three ion channels within heart cells that are crucial in passing electrical signals. Certain drugs alter the normal activity of these channels, changing the timing of a cell's activity in the heartbeat and interrupting normal cardiac rhythms. "Computational methodology developed by preDiCT enables us to bridge the gap between laboratory experiments in cells and live patients. In patients the electrocardiogram (ECG) is a widely used non-invasive clinical tool that provides valuable information on the heart. PreDiCT has greatly improved our understanding of how the ECG relates to biological mechanisms going on within heart cells," said medical professor Peter Taggart of University College London. Researchers from the project are now working directly with the US Food and Drug Administration (FDA) and pharmaceutical companies, and engaged with the European Medicines Agency. PreDiCT builds on a software application called Chaste (Cancer, Heart and Soft Tissue Environment). Pharmaceutical companies are interested in new simulations that preDiCT developed, which enable pharmaceutical employees to better assess whether a drug is safe. "Our tools are great for hypothesis generation. It's one thing to demonstrate safety and another to train people how to use our tools properly. Now we're doing just that and our researchers are working with the drugs industry," said Katherine Fletcher, project manager of preDiCT, based at the University of Oxford, UK. Electrical activation of the heart (bottom-left). Drugs can cause changes in the electrical field passing through the human torso (right), from which electrocardiograms ECGs would be recorded on the surface of the body. The ECG is the most regularly used tool for cardiac diagnostics. According to the preDiCT project, this is the first simulation of its kind: going from ion channel to heart, through the torso to the ECG recording. This simulation allows researchers to work back from ECG disturbance to the underlying heart problem, at the level of individual cells. Image courtesy Nejib Zemzemi. In order to understand the heart, preDiCT's researchers had to study the micro-cellular structures of the heart in order to get a better picture of the larger system. "First you need to figure out how one cell works. Each cell has over 50 ion channels. There are billions of cells. Instead of modeling each cell, you can use high performance computers to figure out the important ion channels and scale up from there. Then you can see the effect a drug has on these channels - for example does it close them up?" Fletcher said. "Now, if the model identifies a potentially dangerous drug, we can test it on real cells in a lab to see if this 'warning sign' should be pursued further. Prediction is therefore faster and more accurate," she said. A model is only the first step in patient treatment. Once an overall safety profile for a drug is established, medical practitioners have to understand how it will affect a patient with a particular medical history. To help in this process preDiCT's researchers are working in partnership with drug companies AstraZeneca and GlaxoSmithKline to investigate drug safety and with Pfizer to use preDiCT's simulations to identify unique 'signatures' for different heart problems. And there's also the problem that electrical activity is just one aspect of how the heart works. "[But,] simulating the physical beating is a much bigger challenge," said Fletcher. In order understand how the heart pumps blood through the body, a bigger and more complicated model is needed. Such a model would have to be in three dimensions and realistically simulate the heart's pumping action. PreDiCT is the most advanced part of a larger project to be able to model every living human: a mathematical model of you, describing everything down to your face, skin, muscle, bones and DNA. This 'virtual you' could give doctors an idea of your reaction to drug treatments that could eventually save your life or even your susceptibility to certain diseases. 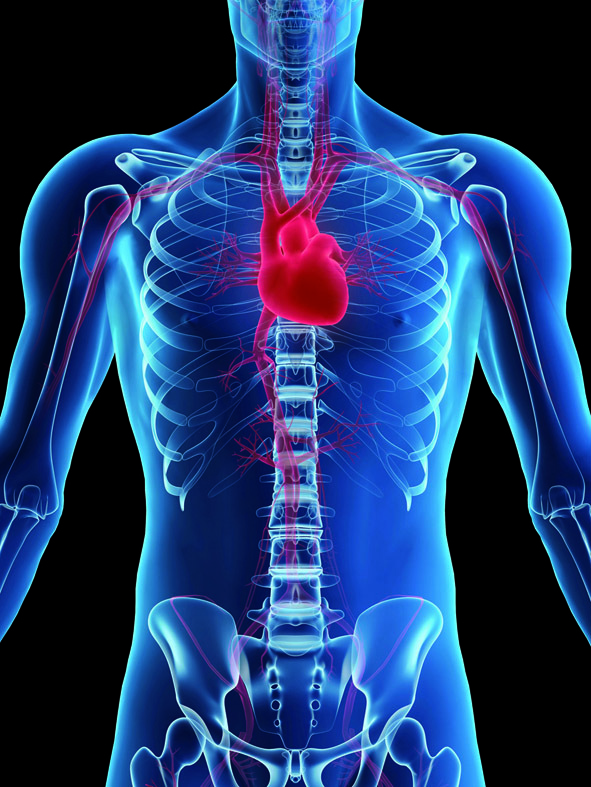 The Virtual Physiological Human (VPH) Network of Excellence is developing standards and best practice across Europe for over 26 projects, developing the most accurate simulations of human physiology, such as the heart or skeletal structure. The project has a budget of 207 million Euros from the European Commission over the next two years. "The eventual goal is healthier Europeans and a healthier European pharmaceutical industry. A unified model of everything is a long way off. Just as one drug doesn't treat all diseases, one model can't possibly describe all aspects of the human body. But, if we make sure that models can work together, we can combine them to investigate whatever we need to look at for a particular patient," Fletcher said. In the near future, the Virtual Physiological Human project will enable surgeons to fuse real and virtual data of the patient and optimize surgical procedures in real time. All patient data could be stored and used within cloud computing. Image courtesy AZ / IS / S. Kaulitzki, M. Abildgaard, V. Yakochuk. The amount of data involved in this sort of project is enormous. To model a heart, "taking into account the internal 3D structure, at all scales, even for one second of activity involves solving millions of equations simultaneously, and quickly generates terabytes of data - and that's before you start to include movement," said Fletcher. To model a beating heart, there are 1026 possible space-time combinations or 100 million, billion, billion data points, according to Peter Kohl, from Imperial College London and co-founder of the Virtual Physiological Human (VPH) Network of Excellence. There is no International System of Units (SI) name for the unit prefix of numbers after 1024. There are mega, giga, tera and peta, and so on, but the SI system stops at 1024 or 'yotta'. "Since 2010, scientists have been petitioning to introduce a new large number name for 1027, called 'hella' because many measurements of the Sun are made in this range," said Kohl. There is even a Facebook petition. Under this naming scheme, the Sun would way 2.2 hella-tons, and "our Virtual Physiological Human project is looking at 0.1 of a hella-data," said Kohl. "Only large-scale computing can cope with this. We are using grids and high-performance computers for this challenge. Clouds will also be important in sustaining a distributed networked infrastructure," said Fletcher. "Today, we still need to answer fundamental questions such as how do we get more access to high-performance computers for simulation and how do we train doctors how to use our software. We have many projects hard at work."